lo actualice hace poco.. mi lap es la que esta fregada ;S haha el monitor no se ve bien.. y en internet ciertas paginas se me cierran! Amy: "Sun's out...Specials are here...Count yourself lucky!" She forgot to mention that luckiest of all, she's there, and I mean really there. here comes the sun doody doo doo! And what's with The Sun? What footage were they watching? Oh, well, it wouldn't be The Sun without negativity, I suppose. I really hope we get to see Ghost Town. I love that song, I think it's their best. 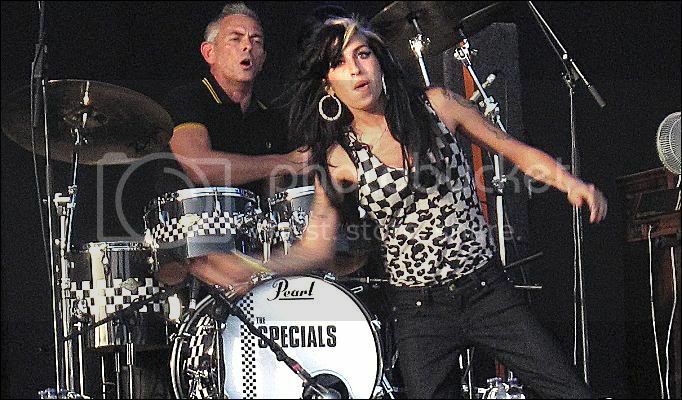 AMY IS AMAZING omg i think this will be the moment for alot of people where their faith will be restored in her. i cant stop smiling she should be so proud of herself. "Your wondering now, what to do, now you know this is the end. Your wondering how, you will pay, for the way you misbehaved." Did anyone else get teary-eyed over this? Seriously, I could weep. Amy looks beautiful, sounds great, and there's that old light in her eyes. I truly hope this proved to be a huge boost to her confidence and helped re-ignite her love for performing. Oh Amy, well done! After fifth play:﻿ Amy sings pretty good all the way through, with some pretty special notes at the end. She's still got it, she's confident, she's brilliant, she's back. It wouldn't quite sink in at first, but at fourth or fifth play it did, and I suddenly got teary-eyed. Edited by Winehousedrunk, 22 August 2009 - 10:11 PM. 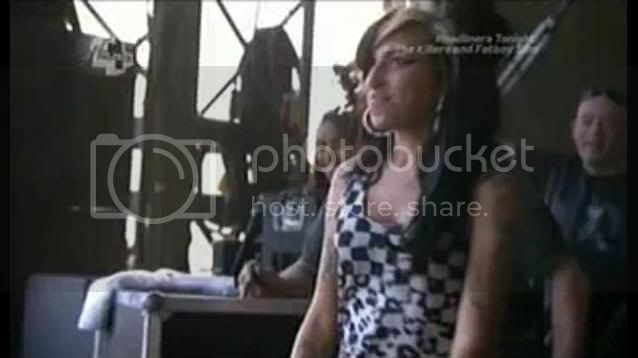 Even SpongeBob SquarePants was there right up front to see Amy. Think I see a smiling Remi Nicole behind Amy at 00:13. Singer shines at V - in the same check top that shocked in 2008. Edited by lyricgenius, 22 August 2009 - 10:37 PM. ^ Wow. Just....... wow. I didn't know whether to post that one or not, as the 'before' pic was so bad; but I'm glad you did, Dave. It puts things in perspective. I'm so freaking happy for her for not giving up. It takes guts to do that, and she's getting there. Edited by Lainey, 22 August 2009 - 10:38 PM. Will I ever stop the tears? So proud of you Amy.